Algae - Good or Bad for Aquaculture and Fish Ponds? Today we are going to go over some fundamental issues regarding pond management and algae growth in a short interview with our very own George Hutchinson, of South Santee Aquaculture. [Justin] Hello George! How about a question or two from our readers. [Justin] Well, our first one comes from Columbia South Carolina. Our reader asks, "Algae - Good or Bad for Aquaculture and Fish Ponds?" [George] We often get this question and you would think the answer is obvious because algae make oxygen and fish need oxygen. But it’s not quite that simple. Algae only make oxygen when they are in the sunlight. They do this as they process carbon dioxide from the water to get the carbon they need to make carbohydrates, the building blocks for food, cell growth, etc. Chlorophyll is the molecule they use to do this. At night they consume those carbohydrates for energy, cell building and division, etc. To consume them they take oxygen from the water and produce carbon dioxide. Just before dawn, the carbon dioxide will peak and the oxygen will be at a minimum creating a point of high stress for the fish. Many times you will see the fish gulping at the surface to get oxygen. This is a natural cycle, but sometimes it can get out of hand, especially if there is an algae bloom occurring. Essentially a bloom occurs when there are sufficient nutrients and water conditions to support rapid cell growth and division. If the conditions change, you can have a rapid die off of the bloom. This changes the dynamic such that much less oxygen is created, but more importantly as algae cells die, bacteria begin to consume them producing more…you guessed it, carbon dioxide. Many fish kills occur due to this phenomenon as oxygen drops to below safe limits. Even more fish kills happen as owners try to manage the algae bloom. The most frequent problem is over use of copper sulfate. Not only does the copper rapidly kill the algae by disabling the chlorophyll, but at high enough concentrations, copper can be lethal to fish. Copper overuse can also severely limit your bacterial action that reduces the naturally occurring build up of bottom sediment. This sediment is where a lot of phosphates, an essential nutrient for algae growth, can be stored in the biomass, only to be released later to produce another bloom. Soon the use of copper becomes a self-fulfilling prophecy that ensures its continued cyclical use. One other bad impact of algae in aquaculture or fish ponds is if the fish are intended to be food. The primary problem is the production of taste and odor compounds that give the fish an earthy or musty taste. 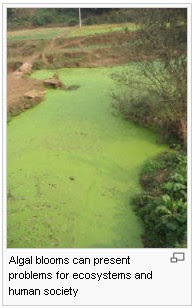 The main culprits are blue-green algae, also known as cyanobacteria. They can also produce toxins that can make the water unsafe for drinking by humans or animals. [Justin] Thanks George, I'm sure this opens up a lot of other questions in our reader's minds. I look forward to talking with you again. What other tactics can be used to control algae blooms? Just what does copper do to chlorophyll? Is the pH swing in the pond due to the algae? Will ultrasound cause algae toxins to be released? When can copper be used and what is the safest way to use it? Over the past couple of days, we have been very busy making friends and sharing what we know about pond management and controlling algae and bio-film online. We are currently in the process of completely redesigning our website at SouthSantee. With this said, you can now find even more answers to your burning questions by visiting a few new places that have been created for us on the web (thanks to Justin Farrow of Neighbor Design). 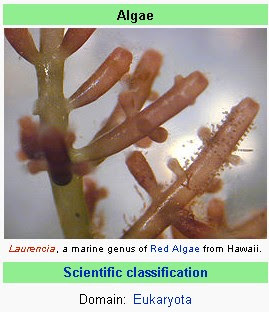 First, we have a new algae information wiki that will be a work in progress from this day forward. 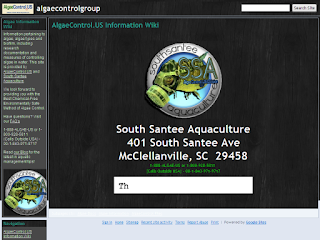 Here, you will soon be able to find any and all information related to research studies related to algae and aquatic management. Next we have (as you can see) many new additions to the blog. We also can now be followed on Twitter. Our future in social networking in order to offer the best service available is well under way, to say the least. Be sure to subscribe to our RSS feed as we are preparing to release some of the first video content and tutorials available on the web related to pond management and the processes involved with controlling algae and bio-film.